According to Fashionista, all ten styles and sizes in the Apple Watch Hermes collection will debut online for the first time at the end of this week, to be available through both Apple.com and Hermes.com. 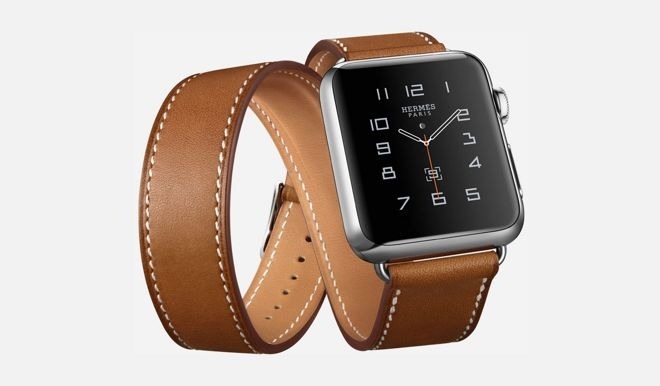 Announced in September alongside new Apple Watch Sport colors and a fall collection of Sport Band options, the Hermes package comes with a stainless steel Watch and leather straps designed exclusively for Apple's device. The Single Tour buckle, for example, is a classic wristwatch strap that starts at $1,100, while the Double Tour design wraps around the wrist twice and comes in at $1,250. The most expensive configuration is the $1,500 Cuff, which features a large leather strap and is only available with Apple's 42mm Watch. The Hermes line went on sale in October at select Apple retail locations, such as Los Angeles, Miami, New York, San Francisco, and Toronto. Hermes also sold the product through its luxury boutiques. In an interview last year, Apple SDO Jony Ive revealed the Hermes partnership was in the works well before Apple Watch was first unveiled in 2014. Under an unusual set of circumstances, Apple allowed the fashion firm access to early models of the device. Even more peculiar is Apple's willingness to allow Hermes to essentially appropriate Watch branding with custom watch faces bearing the company's logo and typography.